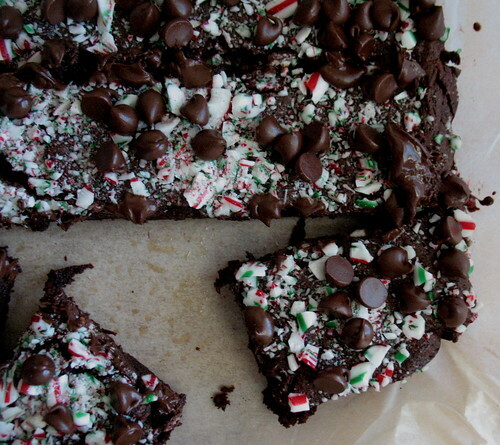 I'm not really a candy cane fan, unless they are paired up with a chocolate brownie. Then I'm in heaven. Candy canes can be notoriously hard to crush as they make such a mess, but I like to put them inside a ziplock bag, seal it shut, then cover them with a tea towel and bash them until they are in tiny pieces. These brownies are delectable and look gorgeous with the brightly colored bits of candy in amongst the chocolate. If you are a chocolate and mint fan, these are for you! Grease and flour a 9x13 inch cake pan, and pre-heat the oven to 350 F. You could, instead of greasing and flouring a pan, grease the pan and then line it with parchment paper. This works well, too. In a saucepan over low heat, melt together the semisweet and unsweetened chocolate and butter. Let cool for about 10 minutes. Whisk in the sugar, and then the eggs one at a time, whisking well after each addition. Add vanilla. In a separate bowl, whisk together the salt and flour. Fold into the chocolate mixture. Pour into prepared pan and smooth the top. Bake for about 25-30 minutes or until a cake tester inserted into the center has only a few moist crumbs clinging to it. For the topping, sprinkle the top with candy canes and chocolate chips after you remove the brownies from the oven and return the pan to the oven for about 30 seconds (don't let the topping melt). Allow to cool in the pan on a rack, and refrigerate until cold.